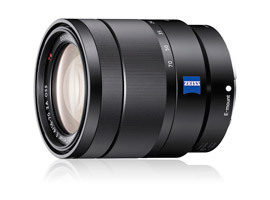 Announced for Sony’s APS-C E-mount cameras, the Sony-made, Zeiss-branded Vario-Tessar T* E 16-70mm F4 ZA OSS is a highly desirable 24-105mm equivalent f/4 constant-aperture model featuring a four-stop stabilizer in a compact design to match the smaller (APS-C) camera bodies. With a total of 16 elements arranged in 12 groups, the optical formula consists of one ED glass element and four aspheres, and coating for increased contrast with reduced color blurring and distortion. As a premium Zeiss model, it has T* coatings to reduce ghosting and flare and features a rounded aperture design for more natural-looking out-of focus highlights. It also includes a stepper-type motor for quieter and smoother AF, a particularly useful addition for video-enabled bodies. The lens focuses to 1.15’ (35cm) and the heavily molded aspherical elements also help minimize size and weight. It has a 55mm accessory, measures 2.62 x 2.95” (66.6 x 75mm), and weighs 10.36 oz (308g). 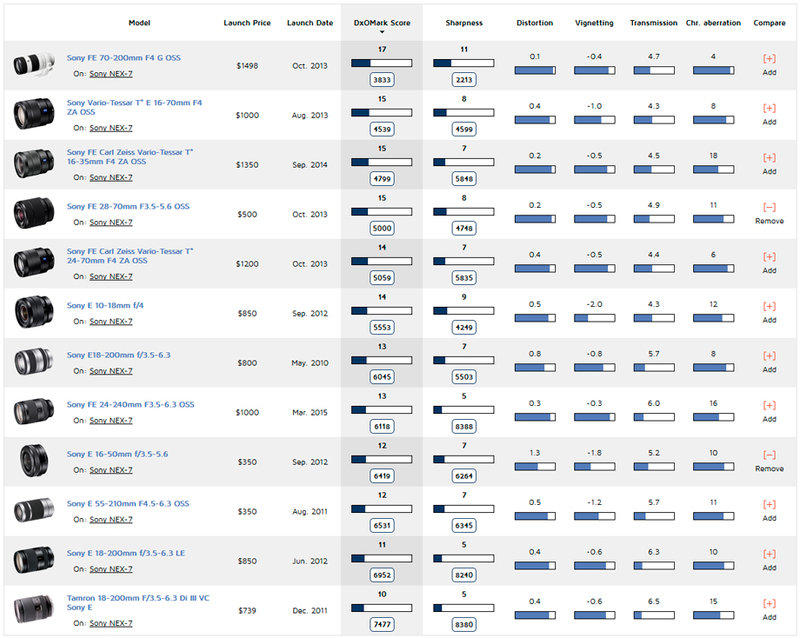 It is available now at around $999 (USD). With a DxO Mark lens score of 15 points on the 24-Mpix Sony NEX-7, the Zeiss Vario-Tessar T* E 16-70mm f4 ZA OSS is a good performer for a lens with a range like this. 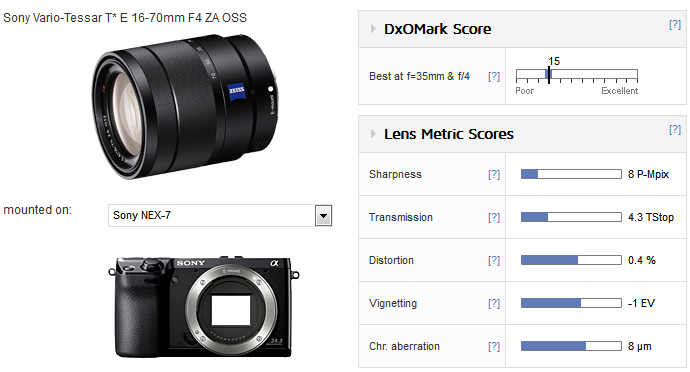 Given the sensor’s potential, a peak 8 P-Mpix sharpness score doesn’t look that great initially, but it is as high as any E-series zooms we’ve seen so far, and overall, this is one of the best-performing models in the lineup. Sharpness is high centrally at the shorter focal lengths, but it achieves more uniform performance across the field in the middle of the zoom range, as is so often the case. Besides sharpness, the lens performs well, with low vignetting and generally good control of chromatic aberration (although low it is visible across the frame at the wide end). However, barrel distortion at 16mm is bordering on complex (mustache) type. 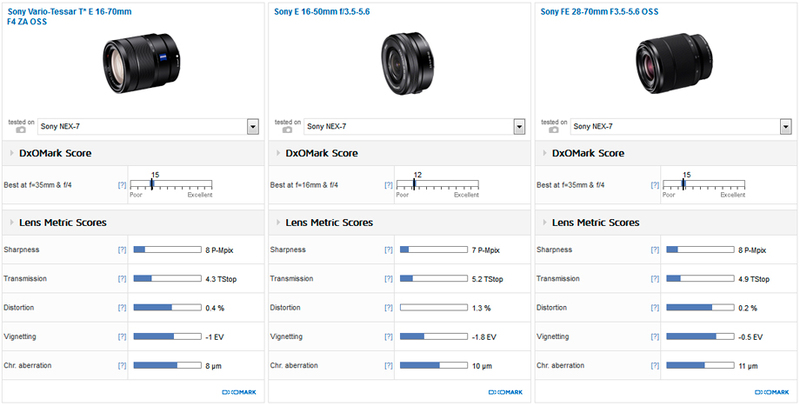 Compared with the retractable Sony E 16-50mm f3.5-5.6 power-zoom pancake that is often found in a kit (but retails at $350), and Sony’s full-frame stabilized 28-70mm f3.5 that costs around $500, the Zeiss-branded model holds up well, at least at the shorter end. It is sharper and has a larger central core of sharpness than the E 16-50mm over the 16-24mm range, and superior uniformity and sharpness at 35-50mm. It also has lower chromatic aberration (noticeable in the corners on the E 16-50mm), much lower barrel distortion, and lower, less noticeable vignetting. The Sony FE 28-70mm is a good performer, but of course much of the appeal of the Zeiss is the 16mm focal length and corresponding angle of view. And it must be said that designing (and manufacturing) wide-angle zooms like the Zeiss is much more difficult. Performance is not dissimilar over the 28-50mm range, but the Zeiss doesn’t perform that well wide-open at 70mm. Bear in mind, however, that the Sony FE 28-70mm has a maximum aperture of f/5.6 at 70mm and the Zeiss is sharper across the field at that aperture. At 70mm the FE 28-70mm has lower vignetting but the Zeiss has slightly better control of lateral chromatic aberration. Distortion is the much the same, though the Zeiss is perhaps less noticeable when comparing straight edges.